*Students that enroll at Guitar Lessons San Rafael, are expected to be able to meet once a week for an hour-long guitar lesson. Students are required to have their own guitar to practice with, and its recommended to practice at least a half-hour to an hour a day. Unless you have the time to practice and meet once a week for a lesson, we recommend that you do not enroll. In order to improve, the student must have time to practice every week. 1. Tuition for one adult student at your home is $120 per one hour-long lesson. Bulk discounts are available and encouraged as weekly attendance is crucial to the success of the student. Lessons must be booked at least 24 hours in advance. We run a first come first serve business. If you fail to book or confirm a lesson in a timely manner, the time slot you are interested in may be given to another student. The only way to lock down the same time each week is to purchase a bulk package of lessons in advance for the month. Regular attendance and practice will ensure that your weekly day and time will remain yours. If you are constantly changing times/days, or not practicing regularly, you are likely to loose your regular spot to another student. 2. With the exception of the first free introductory lesson, the student’s tuition is paid for in advance by the month. NO LESSON WILL BE BOOKED OR TAUGHT IF TUITION HAS NOT BEEN RECEIVED. Tuition is due the last lesson of the month for the next full month of lessons. 3. Tuition payment for missed lessons is forfeited. It is the responsibility of the student to be available at each week’s lesson at the designated time. If the student notifies the teacher of their absence 24 hours before the scheduled lesson, make-up lessons may be arranged with the teacher IF TIME IS AVAILABLE (in most cases there is time available on another day or later in the week.). If the make-up lessons have not been taken by the student within one month, payment for missed lessons is forfeited. The student’s tuition will be forfeited if the student cancels the lesson same day, or if the student fails to notify the teacher of their absence. 4. “Vacation days” (taking a week off lessons with no make-up lesson) must be arranged with the teacher when making that month’s payment. Any additional time off will be charged the regular lesson fee. Student’s will not progress if lessons are continuously missed; therefore, chronic misuse of vacation time may result in being dropped from Drew Krag’s lesson program. *Please keep in mind that the teacher does not teach on major holiday’s such as: Christmas Eve, Christmas Day, New Year’s Eve, President’s Day, Easter, New Year’s Day, Memorial Day, July 4th, Labor Day and Thanksgiving Day. 5. If the teacher is unable to attend a lesson, the tuition payment for that lesson will be credited to next months tuition. In some cases makeup lessons may be provided if there is time. If you cannot make makeup time offered, tuition payment will still be credited to the next month. 6. Termination of lessons by the student in the middle of a month will result in forfeiture of the remaining tuition paid. Your tuition is another incentive to keep at the lessons. 7. If a student fails to attend 2 lessons consecutively without notification, this is considered a withdrawal from the Drew Krag’s Lesson Program and any remaining tuition is forfeited. Any outstanding lesson payments will be billed to the student. 8. If the teacher feels that the student is not taking practice seriously, or feels that the student or parent are acting in a way that is disrespectful, mean, unpleasant or not constructive, the teacher reserves the right to drop that student from classes. In fifteen years of teaching over 25 students per week, the teacher has only had to drop two students from his program. 9. Please understand that the teacher will offer a degree of “coolness” and flexibility, and he will require that in return to constructively work with the student. The bottom line is, communication is the most important thing when it comes to policy and understanding. 10. Absolutely no refunds of any kind. 11. 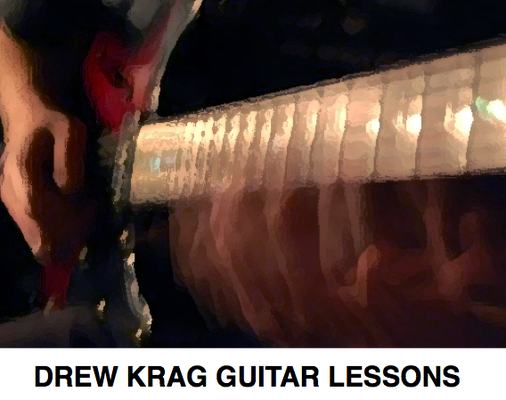 By Purchasing any amount of lessons from Drew Krag Guitar Lessons San Rafael, you have agreed that you have read and understood all the information above. Hi Mariana, yes I teach all ages. The youngest age I usually teach is 5 years old – a child at that age will require a smaller guitar than usual (1/2 size or 3/4 size depending).